Apple's iPad Mini may have been launched as a direct competitor to Amazon's Kindle Fire HD and other 7" tablets, yet they may not be doing a good job. According to a report by AllThingsD, Apple's iPad Mini event and launch may have actually ended up improving sales as opposed to dropping them. When asked about how Kindle sales were moving along, Amazon spokesperson Drew Herdener responded by saying that "Wednesday was the $199 Kindle Fire HD's biggest day of sales since launch and up 3x week over week". Though actual data is unavailable to verify the claims, it makes sense seeing as the iPad Mini's starting price of $329 is more than 50% higher than the 7" Kindle Fire HD and its 1024x768 display is inferior to the HD's 1280x800 display. While Apple may have inadvertently boosted Amazon's sales, things aren't all bad for Cupertino and they don't appear to be having any trouble in moving their iPad Mini. 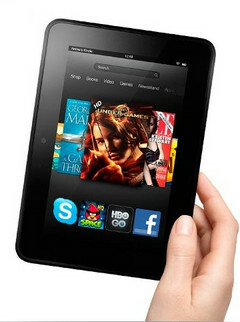 In addition, the sudden boost in Kindle Fire numbers may have simply been users on the fence about their purchase and Apple could be gobbling up all the new customers.